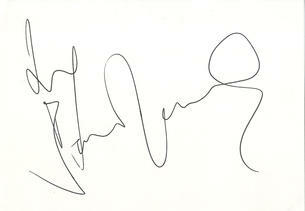 This is an In Person signed white card 6" x 4" by the English actor and comedian. Bobby Davro (born Robert Christopher Nankeville on 13 September 1958) is a British actor and comedian. He is mainly known for his work as an impressionist. He made his TV debut in 1981, but it wasn't until 1983 that he made his television breakthrough at Live from Her Majesty's followed by appearances on the television show, Who Do You Do?.